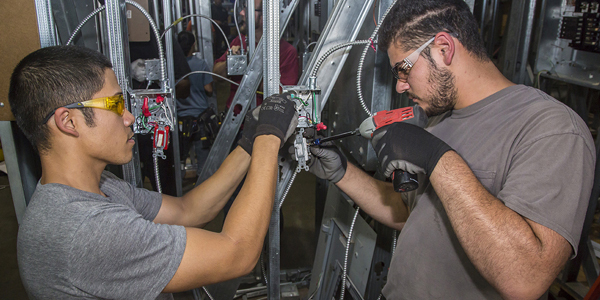 The Joint Apprenticeship & Training Committee offers a complete 3-year program incorporating on-the-job training and supplemental classroom related instruction for the Sound and Communication Wireman Program leading to the installer classification, and continues to accept applications from eligible applicants in accordance with its approved standards and selection procedure. The Sound and Communication Installer Program requires moderate physical effort on the part of the apprentice. Most all of the work day is spent working on one’s feet, climbing and working from ladders, crouching, bending, pulling, and pushing. Fine work with one’s hands require manual dexterity. The apprentice must possess the ability to follow specific directions, especially safety instructions. Most of the work is indoors, but some will be outdoors exposed to environmental elements. We are seeking men and women of all races who demonstrate the best character, aptitude, motivation, and traits conducive to success in our trade. Employers and union representatives who make up the JATC, interview all qualified candidates in an effort to select only the best candidates. A good candidate is one with a record of having done well in school, especially in math and in science, one who has demonstrated reliability, possesses a sincere desire to succeed, and one who has a positive attitude and a desire to work hard. The electrical construction trade is an occupation requiring a high level of knowledge and skill, which we teach to hundreds of successful qualified and fortunate individuals. 2. Hospital 2. One plan funded by employer contribution.